Troy Polamalu is as famous for his hair as he is for playing safety for the Pittsburgh Steelers. His long, curly locks fall below his helmut, so everyone knows who is on the field catching the ball. Quite frankly, he's a beast. It is this notoriety along with his ability to catch a ball that has Head and Shoulders insuring the locks of their high-profile endorser to the tune of $1 million. 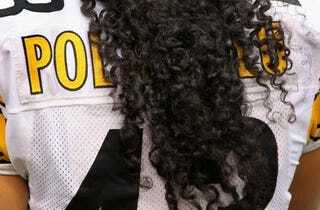 Polamalu wears his hair long to honor his Samoan heritage. His commitment to his heritage is paying off in more ways than one.